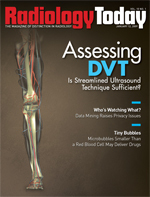 Assessing DVT — Is Streamlined Ultrasound Technique Sufficient? About 2 million Americans suffer from blood clots (thrombi) in the deep veins of the legs each year. In this deep vein thrombosis (DVT), the blood clot itself is not necessarily dangerous. The threat is a piece of the clot breaking off, traveling through the pulmonary system, and lodging in a lung. More than 300,000 people die from such pulmonary emboli (PE) each year. The diagnosis and treatment of DVT, most often with anticoagulants or blood thinners and sometimes surgery, is meant to prevent patients from experiencing PE. Leg swelling, redness, and pain can be symptoms of DVT, and the addition of chest pain or shortness of breath may suggest PE. The sonogram requires compressing the vein with the transducer. “If the vein collapses when you compress it, it’s a normal vein. If it doesn’t collapse, that means there is something wrong, usually a clot inside the vein,” says Cronan, who authored a recent article on contemporary venous imaging in CardioVascular and Interventional Radiology. Depending on the sonographer’s experience, the exam can take up to 30 minutes, as the sonographer must run the transducer slowly along the vein from the groin to the ankle. “A real good sonographer probably can do it in 10 to 15 minutes,” Cronan says. But 10 to 15 minutes can be an eternity to a busy emergency department (ED) physician, who may have to perform the diagnostic test because no sonographer is available in the middle of the night. “To an emergency room physician, that is a lot of time,” Cronan says. One solution may be using a two-point compression technique that is popular in Europe but generally frowned upon in this country, Cronan says. The two-point compression technique is what it sounds like: A physician or a sonographer uses the transducer to compress just two points along the vein, at the groin and behind the knee. About 12 years ago, Cronan hypothesized that in an emergency situation physicians would be safe to perform the quick version of the compression ultrasound on patients who present complaining of calf pain. He had found a 96% to 97% accuracy rate by doing so, but his study was never accepted by the medical community. “People weren’t comfortable enough with it, and the amount of time it saved wasn’t that huge,” he says. When he wrote an article on his hypothesis, which appeared in Radiology in 1996, Cronan took some heat. “People were asking, ‘Why risk missing a couple of percentages when it’s not that much more difficult?’” he says. Cronan thought the idea had been forgotten until physicians from Italy published a study in the October 8, 2008, issue of The Journal of the American Medical Association in which they said the simpler, two-point technique is as effective for detecting DVT as the whole-leg method. The lead author, Enrico Bernardi, MD, PhD, of the Civic Hospital in Conegliano, Italy, and colleagues based their paper, “Serial 2-Point Ultrasonography Plus D-Dimer vs Whole-Leg Color-Coded Doppler Ultrasonography for Diagnosing Suspected Symptomatic Deep Vein Thrombosis,” on a randomized, multicenter study of 2,098 outpatients with a first episode of suspected DVT of the lower extremities. About one half (1,045) underwent the two-point technique of the proximal veins, and about one half (1,053) underwent whole-leg testing. The patients who were in the two-point group also underwent D-Dimer testing, which can be used to rule out active blood clot formation. A negative or normal D-Dimer result would mean no blood clot, while an elevated result would require further testing. In an accompanying editorial, C. Seth Landefeld, MD, of the University of California, San Francisco; San Francisco VA Medical Center; and Stanford University, said that the two-point sonogram and D-Dimer tests could be used to effectively rule out a first episode of DVT and that treatment with anticoagulation drugs could be withheld safely. Cronan is surprised the article hasn’t stirred more conversation about using the simpler technique for detecting DVT. He says one issue is that the societies accrediting ultrasound labs, including the ACR and the American Institute of Ultrasound in Medicine (AIUM), require full-leg studies. The article by the Italian physicians ignores the issue of whether it is necessary to look at the calf veins. “Yet the ACR says that if a patient has calf pain, you should look at the calf veins, and the AIUM says that you should look at the calf veins on everybody,” Cronan says. He believes American physicians would be reluctant to do the simpler, quicker study because, should they miss a blood clot and problems or malpractice occur as a result, they wouldn’t have anyone from the societies willing to testify on their behalf. Generally, Cronan says a clot in the calf veins can be damaging, particularly to the valves. However, he says that problems usually don’t happen immediately. “It usually takes about two years, and you start to get leg swelling and pain in the leg.” The American College of Chest Physicians says calf clots should be treated to prevent the problem, which is known as chronic venous insufficiency (CVI), Cronan says. Cronan says that the Italians’ paper raises some good questions. “If you’re only concerned about preventing PE, then the two-point compression technique may be acceptable. If you are concerned about the long-term outcome, such as CVI, it’s a different story. It is an interesting issue,” he says. Obviously, Cronan says, medical practice cannot change based on just one article. “But everyone agrees the one group who might jump ahead and use it with the idea that they have a green light is the emergency room doctor, who is often required to do his own imaging with a handheld device. They don’t want to have to do a full study because it would take too long,” he says. Cronan says another journal article is raising questions about standard treatment for patients who are diagnosed with DVT. Currently, patients found to have DVT are often treated with anticoagulants. They are told to take the drugs for six to 12 weeks, depending on whether they are diagnosed with DVT or PE. However, an article in an August 2008 issue of Blood, the Journal of the American Society of Hematology, suggests that patients have a follow-up sonogram within three to five months to confirm that the vein has returned to normal, before the anticoagulants are stopped, Cronan says. He is once again surprised that the article did not get more attention because it was based on a well-designed study and suggests a change in medical management. The article in Blood suggests that if the vein is not completely normal, the patient should continue anticoagulant therapy. It makes sense, Cronan says, because one risk factor for DVT is having a history of it. “There are patients who keep getting DVT and keep getting DVT. So it makes sense to do a follow-up baseline study and find out where anticoagulants fit into all of this,” he explains. Meanwhile, Roee Lazebnik, MD, PhD, director of product development (Radiology and OB/Gynecology) for Siemens Medical Solutions’ Ultrasound Business Unit in Mountain View, California, says a promising area of research when it comes to diagnosing DVT is elastography or tissue strain imaging. Elastography is a mode of diagnostic ultrasound that provides information about the stiffness of tissue as well as its anatomy. Many clinical applications for elastography are being explored. Lazebnik says research in this area is ongoing, and currently the accuracy and clinical utility of elastography in aging clots remains uncertain. However, progress is encouraging as to date, several papers have been published. Among these is “Staging deep venous thrombosis using ultrasound elasticity imaging: animal model,” which appeared in the October 2004 issue of the Ultrasound Medical Biology journal. It’s by H. Xie, K. Kim and SR Aglyamov. Another is “Sonographic elasticity imaging of acute and chronic deep venous thrombosis in humans” in the Journal Ultrasound Medicine in September 2006 and authored by JM Rubin, Xie, Kim et al.